[IMG][/IMG]On 9/30/09 trustno1 #33 post "My Name Is" thread: "When I got to work tonight, I thought I would kill a little time so, I took a look at the 'my name is cipher' and, I have to admit, I felt like I had been hit square in the face with it. Of course I started by rechecking the amount of symbols compared to the amount of letters in Mr. Tarrance's name including the middle initial W. I will start with my incomplete solution, then attempt to explain the procedure I used to get what I have (I may be completely wrong). My incomplete solution was JA_K W TARRAN_E. 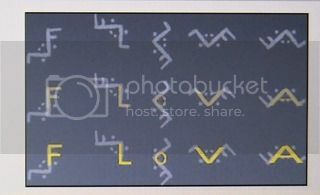 The letters and symbols formed an anagram which when rearranged, seemed to spell out what I have. Since his name has three A's I had to come up with another one. In using the 4'th symbol (zodiac symbol) and since Z is the last letter in the alphabet, I changed it to the first letter in the alphabet A. The symbols that looked like circled 8's could have been two circled R's and one circled taurus sign, giving me a T. the W could have been one of the M's inverted and the J was from the inverted double J. The rest of the letters I just used, except for the extra N and M. There might be a way to convert these letters to C's but, I could'nt come up with any solution. I may be so far out in left field that you can't even see me but, I thought I would let everyone see what I came up with and see what you think. Sometimes my mind just wanders." On 10/1/09 trustno1 post #35 in "My Name Is" thread: "I got to thinking about how to come up with those two missing C's in the cipher and then I recalled some of the work that bababijan (is he still around?) had done. My attempt at mathemagic is in no way as complex as baba's but, here goes. The two letters I did'nt use were N and M. When I try my unproven version of mathemagic, I take N which is the 14'th letter in the alphabet, so 14 can be reversed to 41, then using the subtraction problem 4-1 you get 3, which C is the 3'rd letter in the alphabet. Next for M, it is the 13'th letter, then by multiplying 1x3 you get 3 which again is yadda yadda. Anyway, it is a way to get C's out of N and M. I don't know, maybe my mind needs to quit wandering." Any comments on trustno1's interesting theory? trustno1, I see I am the first to comment. OK? 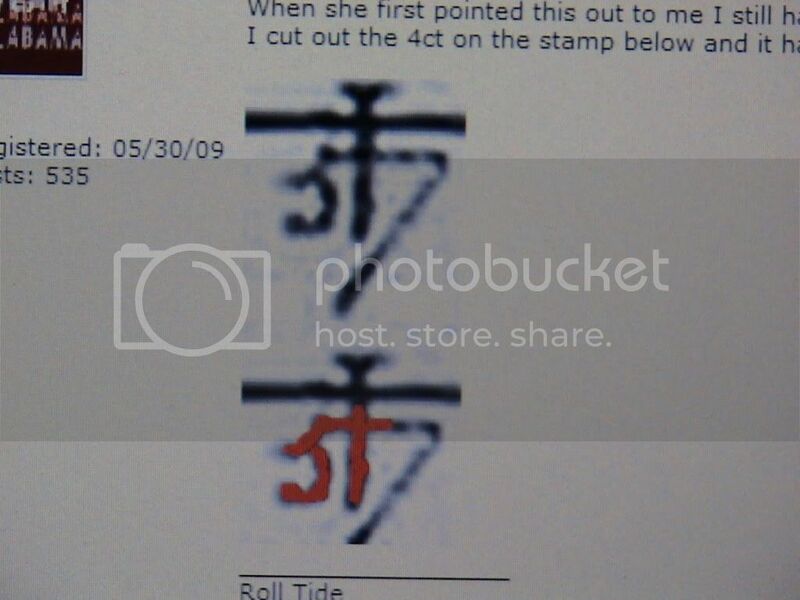 After checking several JTs and some confirmed Zodiac letters, I think you are right that what looks like an M is actually a printed upside-down W. What I quickly double checked and found about JTs/Z's M's is that the printed and even scripted middle part of that letter appears to meet the first and last sections of that letter at the same level. Where-as JTs and Zs W's don't always meet at the same level, i.e. the middle part of the W is lower. 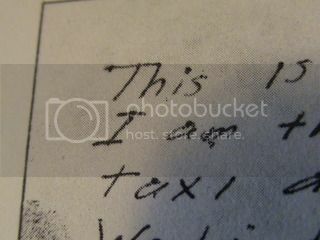 After checking JTs Cursive Capital Rs, I believe you're theory of the circled R's, is amazing. With that in mind, remember that Jack was an old Ham Radio operator and so lots of words sent phonetically in code on the Radio waves: Jack would be JCK or even JK and Walker would probably be WLKR, and so on. So if you are missing a grammatically used consonant or vowel, it would still dial into what it pronounces as. As far as the mathmagic, in the "My Name Is" thread NanetteB, posts that Jack would have loved the reference of his writing using Math (Csquared, etc.) I gather Jack was good at algebra? Whatever! I think your theory is excellent! AND, trustno1, I THINK YOU JUST PROVED HIS NAME WAS THERE! WOW!!!! Edited 5:20 PST Where can you get an O and a T? The Cross/Circle symbol or what looks close to one! There looks to be a lower case T lying sideways over an O! There could be two Js in the mirror J, SO, you have Jo_n Jack W Tarra_ce even without the Taurus symbol(trustno1s T taken from there)! Even though this looks like a new and improved version of your theory, trustno1, that cracks the code, it still goes to you as the code breaker here! Non-the-less, Jacks NAME was there! 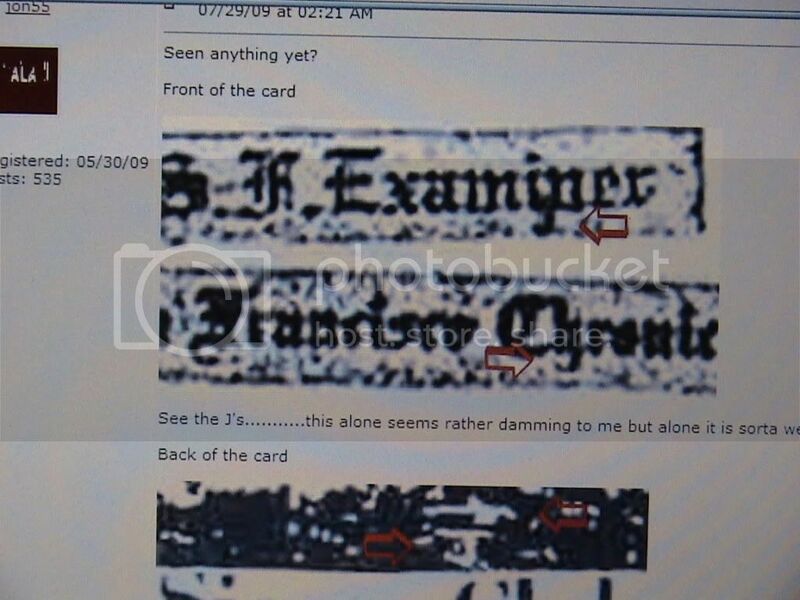 Ok, here's what I decipher from this card, and there's a pretty good chance I'm on to something, considering the person of interest. 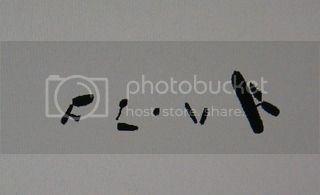 First of all, the small "jTarr"
The ' ' over the A in "kase", being this is positioned closest to "jTarr" and unusually marked, it seems to identify the letter "A" as the next significant character. So, "A", giving us "jTarrA"
The backwards "N" in "knife". So the next significant character is "N", giving us "jTarrAN". Next, paradise spelled with a "C" instead of an "S". So the next significant character is "C", giving us "jTarrANC"
Now, looking at the whole, every word on the bottom of the PARADICE SLAVES portion ends in "E". So the next and ending significant character is "E", giving us... Hello? Is everybody following along? Z was giving clues that spelled out his real name. Once you dial in, it seems to solve it's self. Somebody else also mentioned the skeleton's pose is the same pose JT is doing in the psycho pic of him. Good call! 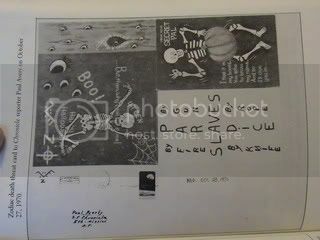 The card also has 13 eyes peeking through holes, with "4-teen" written above the skeleton. Also, the skeleton only has 1 earring. In the "Possible Z Victims" thread it mentions the "possible" victims were found with only 1 earring. It all seems to fit together. So well, in fact, that if the FBI manages to recover the jar JT burried in TX, I'm going to go out on a limb and say the jar will also contain the missing earrings. Anyway, that's enough for one day, it's starting to creep me out. I spend a lot of time looking at the letters/ciphers in different lights. For the most part, it's just all in good fun for a linguistics/grammer junkie who got tired of the newspaper word finds. I've seen an illustration of the "Exorcist" letter morphing into "Leigh" back when he was the POI for a lot of folks. I decided to see what I could come up with. Bear in mind, this is strictly for FUN, and just putting it out there as something interesting. :D After all, who knows!!! [IMG][/IMG] This is the 6/26/70 letter with not only the C in promiCed and the reversed K&J with only one A in the cryptogram, there's also only one "W", one "L", one "E", one "R" AND ONE "T" in the cryptogram W A L K E R T! SO: JACK WALKER T!!! How many more JACK clues are there? Let's all keep on looking! Com'on'! Keep GOING! edited 8/27/09 2PM PST. I just wanted to add that it looks like writer purposely mispelt BUT by adding a cover over the "U" changing it to BAT, with all sorts of marks under it almost as if to make the reader notice these marks and/or the mispelt word. So, this is where the other A comes in. "I see it...and are the last 2 letter JT?? :) Something to think about! " 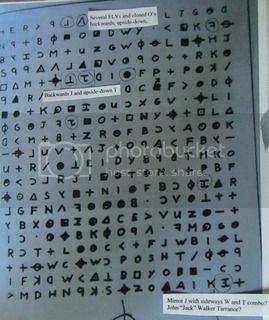 That thread started out quietly and calmly, ended up with new members telling people to go to other sites blurring the good start on a solve but my point is, JT or JWT was noticed before, along with other ideas about this particular cipher. OK, I had been holding back on my opinion of the Halloween Card and that is when you look at the card in the mirror, the pose of the Skeleton resembles a J. I was checking what I had in these old copies of the letters/cards using a mirror, moving them upside, using a zoom lens, etc...just like the some of the letters are (upside down, backwards) in the communications and thought I saw a J in the skeleton pose. And, this may be stretching it a bit,...but Slaves crossed over Paradice might resemble a T.
I am finished for the day but I will look up more finds/solves/matches and post them later. I think this is an eyefull, for now. Great to be here at this MB at this time with so many of you ernest and sincere board members who wish to see this through. I hope you don't mind me locating and posting your finds. Great website Dennis! We'll convince the world that Jack is Zodiac! Hey Catseye, I am not trying to rain on your parade, I swear! I'm on your side....but......I did some research on the 4 cent stamp awhile back and as far as I could tell, they all had the same marking on them. I looked at several pics of them. Concerning the "J's" in the SF Chronicle/Examiner.... awhile back it was either jon55 or maybe BARman, had found it was just a print error/typo with the newspapers.....I could be wrong, but I thought that was the deal. Tamoose53, no rain here, just maybe a sprinkle. I thought long and hard about all these posts for weeks, as they just kept sticking in my head, so, when I got up the nerve to gather what I could recall with the help of trustno1's magnificant solve, I believed that it was possible that the stamps could have been altered by JT as they normally are in color and what we have seen online and in print are in B&W. Stamp collectors are constantly checking for minor alterations that affect the value of them, so thus the use of magnifying them to find the alterations. In this case, I am leaving it on the table that they were altered by JT as Zodiac bring out the initials, esp, under magnification. The same might be with the hooks at the bottom of San Francisco Chronicle, that they could have been altered by Z/JT to enhance the initial J but I do question this myself. When all this breaks about JT, we'll all know whether jon55/Sweetcheeks/Me/BARman/You were right or wrong and to what extent. Thanks for the post. [B]"First of all, as a newcomer here, hello to everyone! I've been playing around with the "My name is -" cipher and came up with what, for me, was a startling analysis of it yesterday afternoon. Bear in mind, this is 100% personal speculation and amateur analysis, and I could have nailed it, be halfway correct, or be dead wrong. I'm very interested in others' comments on what I've come up with. First of all, I am using Z (zodiac sign), 8 (eight in a circle), and J (upside-down Ares symbol, which I believe to be a mirrored J) to represent the non-alphabet characters. With that in mind, my characters appear A E N Z 8 K 8 M 8 J N A M.
The first symbol to catch my eye was the eight in a circle. It is the only character to appear three times, but also, its positioning segments the cipher at it's "core." Sandwiched between the 8s are the letters KM. Instantly, I think "kilometers." I run a calculation on 8 KILOMETERS and find that it is just under 5 MILES (4.97 miles). Layered after the 8-KM are the symbol for Zodiac and the mirrored J. This is the part I believe represents "Jack the Zodiac." Zodiac, of course, is self-evidenct. Mirrored, Zodiac is always the same. However, J, when mirrored, gives the symbol found in this cipher, as well as resembles a "W" with its ends snipped. I feel this character is a symbol Jack created to represent himself. It is indicative of his initials (J. and W., as mentioned). It is also possible to form the letters J,A,C, and a near-K, by tracing one or more lines of this symbol. However, I am less confident in my "tracing" interpretation, than that Jack simply meant the mirrored J as a representation of himself. This character also bears similarity to the "mirrored J with a dot" from the 340 cipher which some have speculated to mean JWT. The final layer, the first and last three letters, AENNAM, are an anagram for "NAME" with duplicative letters A and N.
What I consider to be my "startling" discovery comes through the 8 kilometer/5 mile "central theme." From Pennsylvania, and having little knowledge of California geography, I did a Google search for "5-mile California" and came up with the town of FIVE MILE TERRACE. Five Mile Terrace is situated on CA Route 50, approximately 100 miles from Vallejo and 54 miles from South Lake Tahoe. It's 8-1/2 miles from Pollock Pines. At the very least, Jack would have been familiar with this locale. FIVE-MILE appears in the cipher as I analyze it. TERRACE does not. J.W. 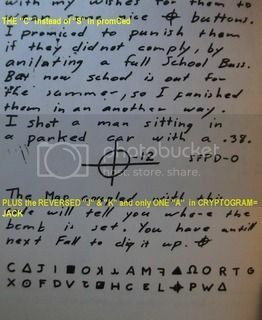 or "Jack" is in the cipher using my analysis. TARRANCE is not. The duplicative letters in the "NAME" anagram are A and N. The letters of discrepancy between TERRACE and TARRANCE are A and N.
If Jack's DNA comes back negative, of course, all of my theories are out the window. However, at the very least, I think it's another possiblity to consider, an interesting communication spark, and possibly something to get others' gears rolling and more ideas flowing on this or the other ciphers! [B][/B]"